Constructed in 1898 the hotel on the corner of West St. and Barrow St. operated originally as the Knickerbocker Hotel, then from 1910 to 2000 under several Keller names, including New Hotel Keller, Keller Abingdon Hotel, and Keller Hotel. Census reports from 1910 through 1940 yield sporadic information about the Hotel Keller. The 1910 U. S. Census listed 11 people living at 150 Barrow St. The head of household was Eugene Glass, 23, born Russia, immigrated 1905, alien, clerk, hotel. The other 10 mostly had occupations relating to "hotel." It may be the census taker did not record the transient residents. The 1920 Census recorded only 3 residents at 150 Barrow St., consisting of A. J. Henderson (employer, own hotel) with his wife (cashier, hotel) and daughter. The 1930 Census recorded 20 residents, including 4 with occupations relating to seamanship. The 1940 Census recorded 98 lodgers at the Keller-Abington [sic] Hotel, 150 Barrow St. These included 5 seamen, and 21 others working on the docks or as longshoremen. An uncredited photo dated 1918 in the New York Public Library's Digital Collections shows the corner of West St. and Barrow with a sign reading Hotel. A photo by Percy Loomis Sperr in the New York Public Library's Digital Collections shows the hotel in 1929, when the sign read Hotel Keller Abingdon. A later NYPL photo dates from 1940. By then the more modest 1980s Hotel Keller sign had replaced the larger Keller Abingdon version. 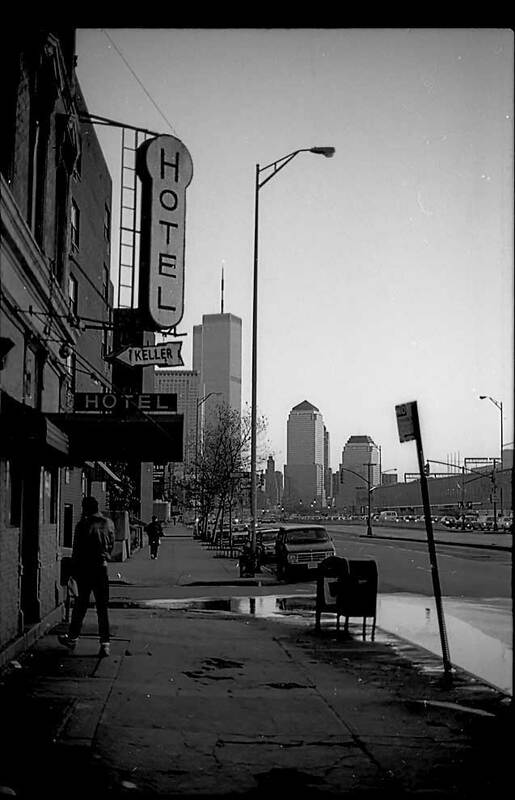 This view of the Hotel Keller was taken in 1993. This view dates from 2013. The KELLER is gone!